The reuse of Learning Designs can bring significant advantages to the educational community such as the diffusion of best teaching practices and the improvement of teaching quality and learning outcomes. Although various tools, including Recommender Systems, have been developed to implement the notion of reusing Learning Designs, their adoption by teachers falls short of expectations. This paper investigates the results of providing explanations for Learning Design recommendations to teachers. To this end, we designed and implemented an explanatory mechanism incorporated into a Recommender System, which propose pre-existing Learning Designs to teachers. We then conducted a user-centric evaluation experiment. Overall, this study provides evidence that explanations should be incorporated into Recommender Systems that propose Learning Designs, as a way of improving the teacher-perceived experience and promoting their wider adoption by teachers. The more teachers accept and adopt Recommender Systems that propose Learning Designs, the more the educational community gains the benefits of reusing Learning Designs. Agostinho, S. (2009). Learning Design Representations to Document, Model, and Share Teaching Practice. In L. Lockyer, S. Bennett, S. Agostinho, & B. Harper (Eds. ), Handbook of Research on Learning Design and Learning Objects: Issues, Applications, and Technologies (pp. 1–19). Hershey: IGI Global. https://doi.org/10.4018/978-1-59904-861-1.ch001. Beetham, H., & Sharpe, R. (2007). Rethinking pedagogy for a digital age: designing and delivering e-learning. https://doi.org/10.4324/9780203961681. Bennett, S., Agostinho, S., & Lockyer, L. (2005). Reusable learning designs in university education. Proceedings of the IASTED International Conference on Education and Technology, ICET 2005, 2005, 102–106. Retrieved from http://www.scopus.com/inward/record.url?eid=2-s2.0-33751297745&partnerID=40&md5=de22754ab9711f446c2d71bc23695040. Accessed 27 Nov 2018. Chen, L., & Wang, F. (2017). Explaining recommendations based on feature sentiments in product reviews. In Proceedings of the 22Nd International Conference on Intelligent User Interfaces (pp. 17–28). New York: ACM. https://doi.org/10.1145/3025171.3025173. Dalziel, J. (2003). Implementing learning design : the learning activity management system (LAMS). Retrieved from http://hdl.handle.net/1959.14/79594. Accessed 28 Nov 2018. Karga, S., & Satratzemi, M. (2018). A hybrid recommender system integrated into LAMS for learning designers. Education and Information Technologies, 23(3), 1297–1329. https://doi.org/10.1007/s10639-017-9668-0. Koper, R., & Bennett, S. (2008). Learning design: Concepts. In H. Adelsberger, Kinshuk, J. Pawlowski, & D. Sampson (Eds. ), (pp. 135–154). Springer Berlin Heidelberg. Retrieved from https://doi.org/10.1007/978-3-540-74155-8_8. Kouki, P., Schaffer, J., Pujara, J., O’Donovan, J., & Getoor, L. (2017). User preferences for hybrid explanations. In Proceedings of the Eleventh ACM Conference on Recommender Systems (pp. 84–88). New York: ACM. https://doi.org/10.1145/3109859.3109915. Lockyer, L., Bennett, S., Agostinho, S., & Harper, B. (2009). Handbook of Research on Learning Design and Learning Objects. In L. Lockyer, S. Bennett, S. Agostinho, & B. Harper (Eds.). IGI Global. https://doi.org/10.4018/978-1-59904-861-1. Maina, M., Craft, B., & Mor, Y. (2015). The Art & Science of Learning Design. Rotterdam: Sense Publishers. Retrieved from https://www.sensepublishers.com/catalogs/bookseries/technology-enhanced-learning-1/the-art-and-science-of-learning-design/. Accessed 27 Nov 2018. McNee, S., Lam, S., Konstan, J., & Riedl, J. (2003). Interfaces for Eliciting New User Preferences in Recommender Systems. User Modeling 2003, 2702, 148. https://doi.org/10.1007/3-540-44963-9_24. McNee, S. M., Riedl, J., & Konstan, J. a. (2006). Being accurate is not enough: How accuracy metrics have hurt recommender systems. 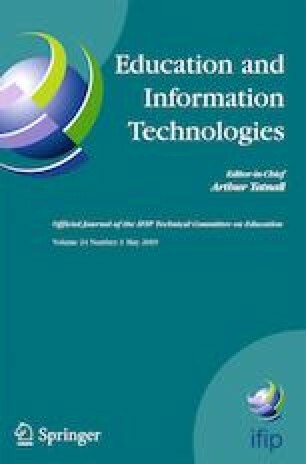 CHI’06 Extended Abstracts on Human Factors in Computing Systems, 1101. https://doi.org/10.1145/1125451.1125659. Mor, Y., & Craft, B. (2012). Learning design: reflections on a snapshot of the current landscape. Research in Learning Technology, 20. Retrieved from http://www.researchinlearningtechnology.net/index.php/rlt/article/view/19196/. Accessed 27 Nov 2018. Muhammad, K. I., Lawlor, A., & Smyth, B. (2016). A live-user study of opinionated explanations for recommender systems. In Proceedings of the 21st International Conference on Intelligent User Interfaces (pp. 256–260). New York: ACM. https://doi.org/10.1145/2856767.2856813. O’Donovan, J., Smyth, B., Gretarsson, B., Bostandjiev, S., & Höllerer, T. (2008). PeerChooser: visual interactive recommendation. In SIGCHI Conference on Human Factors in Computing Systems (pp. 1085–1088). Florence: ACM. https://doi.org/10.1145/1357054.1357222. Paquette, G., Teja, I. D. la, & K. Lundgren-Cayrol. (2006). Learning design classification definitions. Retrieved from http://helios.licef.ca/residld/4/Classification_Design_P%C3%A9dagogique.doc. Accessed 27 Nov 2018. Prieto, L., Dimitriadis, Y., Craft, B., Derntl, M., Émin, V., Katsamani, M., … Villasclaras, E. (2013). Learning design Rashomon II: Exploring one lesson through multiple tools. Research in Learning Technology, 21(0). https://doi.org/10.3402/rlt.v21i0.20057. Pu, P., & Chen, L. (2006). Trust building with explanation interfaces. In Proceedings of the 11th International Conference on Intelligent User Interfaces (pp. 93–100). New York: ACM. https://doi.org/10.1145/1111449.1111475. Pu, P., & Chen, L. (2011). A user - centric evaluation framework for recommender systems. Proceedings of the 5th ACM Conference on Recommender Systems - RecSys ‘11, 157–164. https://doi.org/10.1145/2043932.2043962. Quijano-Sanchez, L., Sauer, C., Recio-Garcia, J. A., & Diaz-Agudo, B. (2017). Make it personal: A social explanation system applied to group recommendations. Expert Systems with Applications, 76, 36–48. https://doi.org/10.1016/j.eswa.2017.01.045. Simon, B., Pulkkinen, M., Totschnig, M., & Kozlov, D. (2011). The ICOPER reference model for outcome-based higher education. Retrieved from http://www.icoper.org/results/deliverables/D7-3b. Accessed 27 Nov 2018. Tintarev, N., & Masthoff, J. (2011). Designing and evaluating explanations for recommender systems. In F. Ricci, L. Rokach, B. Shapira, & P. B. Kantor (Eds. ), (pp. 479–510). Springer US. Retrieved from https://doi.org/10.1007/978-0-387-85820-3_15. Wills, S., & McDougall, A. (2009). Reusability of online role play: Learning objects or learning designs? In L. Lockyer, S. Bennett, S. Agostinho, & B. Harper (Eds. ), Handbook of research on learning design and learning objects: Issues, applications, and technologies (p. ??). Information Science Reference. Retrieved from http://ro.uow.edu.au/asdpapers/96/. Accessed 27 Nov 2018. Yoo, K. H., & Gretzel, U. (2011). Creating more credible and persuasive recommender systems: the influence of source characteristics on recommender system evaluations. Recommender Systems Handbook, 455–477. https://doi.org/10.1007/978-0-387-85820-3.